Indeed, is the city of new Jerusalem a female God? What does Ahn, Sang Hong say about (interpret) Revelation 21? 새예루살렘성이 내려오는 때는 지금이 아니고! The time when the new Jerusalem will come is not now! it will be done after Chiliasm passes. 그래서 여기, 새하늘과 새땅은 언제 나온다는 말씀 입니까? Therefore here, when will it be that a new heaven and a new earth will come? 이 세상 끝이 되야 됩니다. It will be at the end of the world. 우리를 위한 새하늘과 새땅을 바라보는 것입니다. We will look at a new heaven and a new earth for us when this world has finally come to an end. 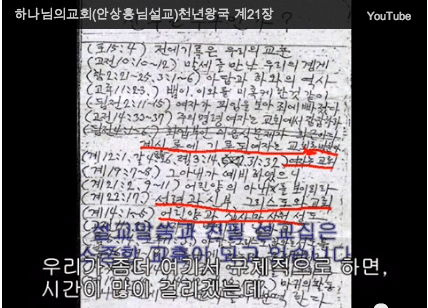 그럼 요한계시록 21장을 다시 돌아가 보겠습니다. Then, we will go back to Revelation Chapter 21 again. 또 내가 새하늘과 새땅을 보니 처음 하늘과 처음땅이 없어졌고 바다도 다시 있지 않더라~ 그랬어요. 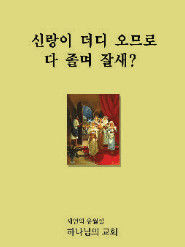 이 바다가, 바다도 있지 않다고 했으니까, 이 세상의 바다가 없어졌습니까? 지금! It is said, ‘the sea, there was no longer any sea’ the sea has gone? now! Has the sea already gone? 또 내가 보매 거룩한성 새 예루살렘이 하나님께로부터 하늘에서 내려오니 그 예비한 것이 신부가 남편을 위하여 단장한 것 같더라. And I heard a loud voice from the throne saying, “Now the dwelling of God is with men, and he will live with them. They will be his people, and God himself will be with them and be their God. 이제 눈물을 우리 눈에서 씻기시면은, 다시 사망이 없습니다. Now when he wipes every tear from our eyes, there will be no death. 그러니까, 모든 눈물을 우리 눈에서 씻기시매 다시 사망이 없고 애통하는 것이나 곡하는 것이나 아픈 것이 다시 있지 아니하리니 처음 것들이 다 지나갔음이러라. 얼마나 여기에서 이렇게 잘 말해 줬습니까? How well it is spoken here (or in this sentence)? 그래서 여기 21장에서 쭈욱 보면은 이제 하늘나라의, 그 하늘의 예루살렘이 내려옵니다. Thus, if you read through this in Chapter 21, now the kingdom of heaven, the Jerusalem from heaven will be coming down. In reference to verse 9, “had the seven bowls full of the seven last plagues came and said to me, “Come, I will show you the bride, the wife of the Lamb.” And he carried me away in the Spirit to a mountain great and high, and showed me the Holy City, Jerusalem, coming down out of heaven from God. 우리가 지금까지 말하는 이 예루살렘은 우리 성도들이라고 말을.. 자리를 다 채울 수 있는 십사만사천 성도들이 되는 것 입니다. The Jerusalem we have been mentioning so far will be the one which can be filled with our congregation (believers), that will become 144,000 saints. 바로 그 예루살렘, 새예루살렘 안에는! This very Jerusalem, inside of the new Jerusalem! 여기 히브리 12장 22절에 뭐라고 말했습니까? Here what is written/stated in Hebrews 12:22? 하나님과 모든 천만천사들이 다 그 안에 있습니다. Look, in Hebrews Chapter 12 verse 22, there is not only believers, but also, God and thousands of angels in it. 히브리 12장 22절, 그러나 너희가 이른 곳은 시온산과 살아 계신 하나님의 도성인 하늘의 예루살렘과 천만 천사와 하늘에 기록한 장자들의 총회와 교회와 만민의 심판자이신 하나님과 및 온전케 된 의인의 영들과 (신약) 새 언약의 중보이신 예수와~ 및 아벨의 피보다 더 낫에 말하는 뿌린 피니라. 모든 그 온전케된 의인들이 그 안에 전부 다 있습니다. but also, God, thousands of angels, Jesus, and the righteous men made perfect. 아니 이렇게 장엄한 그 예루살렘이 어떤 일개의 한 여자로서 표상한다고 해서야 되겠습니까? Well, can this such magnificent Jerusalem stand for the one mere woman? 이 문제 가지고 제가 책을 하나 내겠습니다! So, I am going to publish one book in regards to this matter! In Revelations Chapters 20, 21, and 22, it is described about incidents after Chiliasm. Thus, Special attentions are required when reading. Yes she is not just a mere Women she is God ! Father was right to ask that ! Perhaps WMSCOG had shown you some videos or photos where zahng gil jah fetching water and giving to a number of people to drink and she already became god. My friend, did you ever read the story of the life of Mother Theresa? She’s more kind in attending problems of people. She personally attending the needs of the sick, comfort them, give them medicines and treatment. In this world she was hailed and praise not as god but a dear mother. Really, you’re lost. You’re mother god deceives many and she is now sick or dying or already dead. How she became god is an invention or idea created by opportunists like her and her group, the WMSCOG. A man from the east was fulfilled by Cyrus. Does it mean that there should be no more fulfilment? Revelation and Isiah say that a man from the east should appear in the last days to release spiritual Israelites from the spiritual Babylon. and also in The Law of Moses and the Law of Christ Ch.6. Yes Leigh, what you are saying would be 100% correct. @Leigh — Where in the Bible you find the name Ahnsahnghong????? and Zang-Gil-Ja. You invent so many many many things and you become a worshiper of your own invention. If your conviction is to remain with WMSCOG, so be it. That’s your choice. I’m only giving you a piece of enlightenment that you are worshiping people or persons like you and that is the greatest sin GOD will never never forgive. That kind of not-logical shouting would not help anything. What you say is totally out of the context and point. The poster seems that he/she wants to say that Rev22 should take place after 1000-years rest (The Sabbath Rest), not before it, quoting Christ Ahnsahnghong’s interpretation. Of course the poster looks like to slander that what WMSCOG teach about the bride of Rev 22:17 as God the Mother in the flesh does not seem to be supported by Christ Ahnsahnghong. Christ Ahnsahnghong said that Rev 22:17 Spirit and the Bride will appear before the Sabbath rest(Spiring of Water of Life Ch.24, 35) and also in The Law of Moses and the Law of Christ Ch.6. Think about the prophecy of ‘the one from the east’!! @remco915 hmm. I would like to correct your comment. You are really out of context here. You do believe in Jesus right? Jesus Christ comes on this earth in the Flesh, am I right? Then now why are you saying that we are believing in God in the Flesh? Are you not believing in God in the Flesh? Please do not slander us for you don’t know what is the Prophecies of the Bible was fulfilled by God the Mother Zahng Gil Jah. Actually, She Fulfilled everything, secretly. You know why? Only TRUE GOD’S PEOPLE will know her, because She is a mystery that made known only to the TRUE GOD’S PEOPLE. (c.f. Col 1:26, Mt 13:11, Gal 4:26[ISV]). I really pray to God Ahnsahnghong that you will be save in this dark and sinful world. She is going to die soon of a human cancer so she is just a woman. That’s why there are no more trips to Korea she is at deaths door. God does not die of such things but in fact surrenders there spirit like Crist did. Pretty much everything that came out of ahnshahnghongs mouth is wrong. What happened to her leading her people the 144,000 back to heaven together there must have been a change in plains. or god changed his mined or perhaps the future is distorted. This Passover thing never made sense to me. I got a great idea lets keep it every Sunday. You’re being called cult members because your group has proven itself to be very cult like. This group practices separating people from their support systems and replacing it with themselves, a very real US vs. THEM type of mentallity, and an idea that they are exclusive and the only ones with the truth. If you have done any research on your own outside of this controlling group you would come to the realization that they in fact do not have the truth and in reality the WMSCOG’s truth keeps changing over time! Did you know that at one time the WMS taught that black people are cursed and are not likely to be saved? They no longer teach this because it is unpopular and the WMS found out that they can use and abuse these folks just as well as they can use and abuse anyone. This is not a group you should be proud to be associated with. My humble advice is to get out NOW and go search for real truth not something that someone else is spoon feeding you as the truth. Take the wool off of your eyes! God gave you a brain and He expects you to use it not let others manipulate it! Insulting people has the opposite effect. It’s funny you say that but meanwhile there are churches in Africa and there are many Black members worldwide. What you talk about are the Mormons who use Noahs son for that argument. You talk about truth yet you obviously are one who goes to sunday church, keeps communion, prays to the cross keeps pagan holidays like easter and xmas all things not in the Bible and you think you are enlightened? Satan has pulled the wool over you and the 3 billion sungod worshipping people around the world. Things that Jesus Christ kept like the Sabbath Day and Passover and even said if you want to receive eternal life keep the Commands. People like you talk about the Buble and Jesus and you don’t even believe what it says! Truth??? You can’t handle the TRUTH! I DON’T EVER EVER WISHED TO BE DESTINED TO HELL. IN YOUR CASE IF YOU DON’T CHANGE YOUR STAND, I FEEL YOU’RE ALREADY DOOMED. YOU DON’T EVEN KNOW WHAT IS THE TRUE CONCEPT OF GOD, VERY FUNNY BUT SAD INDEED. NOBODY HAD SEEN GOD AT ANYTIME. Passover doesn’t make sense to you because you are an Idiot and besides shouldn’t you be out tempting something somewhere. Who are you to be so foul and nasty? Sorry, I forgot you are just following the example set before you by the WMSCOG. FYI You might want to change the name you are posting under. Just a suggestion. Actually I was wondering the same thing and my only answer is they are new to the church because best believe that kind of ungraciousness is not allowed in ano of oyr churches! Now with your blasphemous rant about the Passover it is the single most important thing in the Bible that under the Law of Christ will give us forgiveness of sins, protection from disasters and eternal life. Seeing your ignorance of something that is holy and precious to God proves you have no way to be forgiven and when the Great Tribulation happens will suffer along with other people around the world, that is if some accident doesn’t happen beforehand. isa.44.6.kjv Thus saith the Lord the King of Israel, and his redeemer the Lord of hosts; I am the first, and I am the last; and beside me there is no God. God would never lie. So if they are saying Mother God been there since the beginning, why is that not stated? And wait you’re going to tell me Mother God and Father God are one. So is the God the Father, Son, and Holy Ghost. Since when does Trinity means 4? Im trying to save my sisters’souls here. You know what i was told a lot of things when i went to this church one time. Now they are saying things differently. I think they go to sites like this, have their meetings and tell their members something else before members question them. My sister be at the church 7 days a week. 1st it was 9:30pm now its 11:30pm. I understand keeping the word of the lord but man! She’s in it deep and i can’t get her to understand or willing to listen to me. Everytime i say something she says , “well if you look at this verse right here….or “thats not what that verse mean” Well dang how come you can say this is What that means but i can’t say this is what this mean? Like im never right, and dont know what im talking about. F.N., that is what is so frustrating about this group. There is no fairness or compromise. You must listen to them, but they won’t listen to you. They are right and you are always wrong, in their eyes. You should go into their church with them but they can’t even set foot in your church, even for a funeral or wedding. Not one bit of give and take. And yes, they can change what they have fervently preached, like the end of the world date in 2012, and there can be no questioning why. I know of a guy in Chicago Zion who said to a group of us,”I am so sure that the world will end in 2012, that if it doesn’t, they should bar the doors of this church and put a padlock on it.” Well, guess what, it didn’t happen and he is still a member. Now they said they never preached it. Interesting that all their members thought that was the end of the world date if they never preached it. If they could be so completely wrong about that, then what else is complete B.S.? Rhetorical question. I know what else is B.S. I feel so sorry for the members who are so complete fooled and are being taken advantage of by these manipulators. I met members of this group back around 2003 and they were saying this 2012 thing then too. I remember at the time I was into new age stuff, and in quite a number books the 2012 thing was being promoted. Hearing this 2012 thing from a church was a bit confusing but that was not the only thing confusing they preached. Since then I have realized that if any religion is true, it is Christianity, and the gospel. And not the supposed christianity of world mission society church of god either. It’s just as bad as the sun myung moon church, another Korean who claimed to be Christ!! What is it about Koreans that they love to claim to be Christ so much? Maybe its because Koreans know a lot about power structures and control? Who knows. Hi all, I am an exmember of this Church/cult! They are so brain washing people’s minds. Killing their souls. When I got Baptized They never told me that Ahn Sahng Hong was married and had children. Even about the so called Heavenly Mother being married. We were never told about the So Called Heavenly Mother being a CHAIRWOMAN to the International We Love You Foundation. Not even one member of our church was ever told or even heard about we love you foundation group! Also they says bible says that God know everything and they so called Heavenly Mother could not even speck the same language as her Sons and Daughters who lived around the world. She always had to have Korean member with her to translate their language. Which I thought was very odd for someone who was meant to be God. You do know Jesus Christ spoke Aramaic right? So Heavenly Mother was born and raised in Korea plus she is in the flesh so it’s not a total shot in the dark why she speaks Korean. The Bible says the Jesus was made human in every way possible so that is why though He was God he was still subject to rules of this earth. Christ Ahnsahnhong and Heavenly Mother were also born in flesh just like the rest of us so are subject to the same problems. It is sad you had such a closed mid and heart to the teachings you were allowed to receive by God. Now you blasheme the Holy Spirit for which you cannot be forgiven. Why does mother make children keep 5am service for feasts? Is that in the bible. It’s unfair children have to suffer like that. They are so exhausted on schooldays during the feast. So how does one become a non member? Hi all, I have read all of your comments, both negative and positive about this group – WMSCOG. There are some Zions in Hanoi and around Vietnam, for sure. I personally have a sense of CHAOS within the Earth, among nations and the Judgement Day before one of the followers talks to me in the Banking Academy campus. I have been baptized on Friday, 11 of August, 2017. in 9PM to be exact. And after I attended their ceremony (I think it is the Sabbath Rest), I told my mother that I want to buy a Bible to study. However, my mom refused to let me buy that book, and she also told me that, my family worship our ancestors and grandfather/mother, in short, I am a Buddist. I want to leave this group, but they wont let me go and they keep telling me to keep faith in the Heavenly Mother and Father, the Sabbath (like in Tuesday and Saturday) and things about Ahn Sahng-hong and Zhang Gil-Jah. I have known about the name Ahn Sahng-hong just right after the baptism (I haven’t read anything in the Bible yet). Please, who knows the truth about this, please tell me how to leave this group.